You know how spinach likes to grow in cold weather and that’s why it’s hard to find in the mid-summer months? Orach, also known as Mountain Spinach” grows here during our entire growing season. Upon googling “orach” once again, I’m reminded and in turn reminding you of its nutritional value. This plant is packed with vitamins and minerals such as calcium, magnesium, anthocyanins, phosphorous, iron, protein, zinc, selenium, tryptophan, vitamin C, vitamin K, carotenes and dietary fibre. Orach is a nutrient-rich superfood. Canadian Living magazine (May 2016 issue) calls orach “the new kale.” It also has a long history of use as a medicinal plant. Descriptions include “possibly one of the more ancient cultivated plants” and “a substitute for spinach either fresh or cooked”. The seeds are edible and rich in Vitamin A, can be ground into a meal and put into stews, breads, cereals, etc. and are also used to make a blue dye. The result was wonderful. 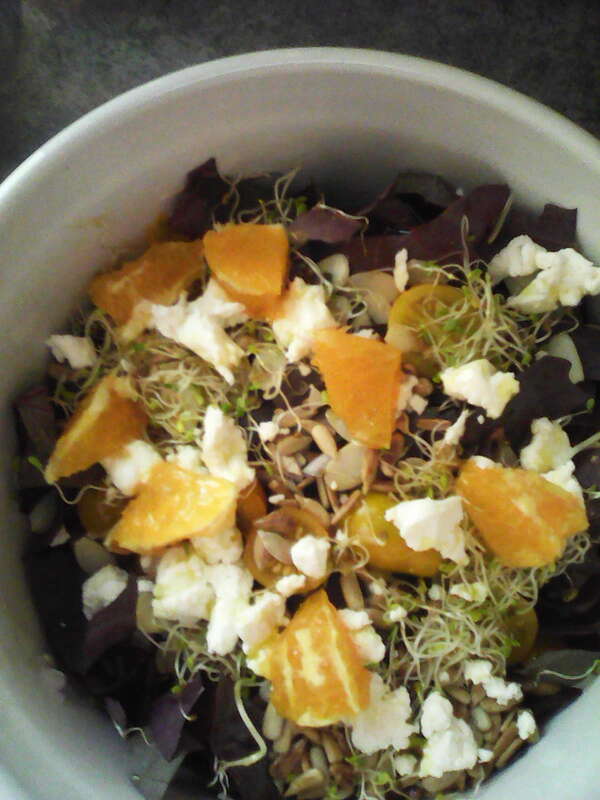 You can toss in any mixture of nuts, seeds, fresh or dried fruits, sprouts, shoots, cheese . . . limitless options. Add a bagel or some multi-grain bread on the side and it makes a complete meal. These little puppies are still playing the “maybe I’ll be ready Friday, maybe I won’t be” game. I’m trying to make sure each of you gets some when you order. Different name as above, same game. Each day when I do my walkabout through the gardens I pick a few cherry tomatoes and a few larger ones, not really an orderful but enough to say some are ready . . . today. These should all be available to order next week. The peppers are loving the rain and are producing very well. So far, I have green jalapenos and yellow alma paprika peppers for you while the others are reddening or yellowing up. The jalapenos will turn red eventually but the green ones are what we use in our fresh salsa and can be used on pizza without burning your mouth. Alma Paprika peppers are interesting. 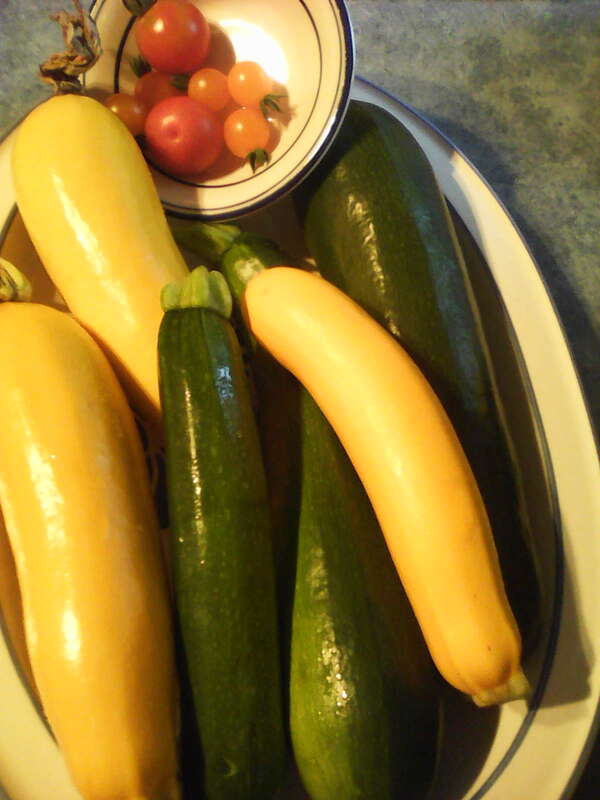 They are round about the size of a medium tomato. They start out yellow, then turn orange and finally a bright red which makes them look exactly like a tomato and can be confused for one if in the same basket as tomatoes. They are not considered a hot pepper but definitely add a bit of “zing” to a salad. I plan to dry some this year to make paprika. These have now been weeded and are going to take a little break from picking so they can grow up big and strong. Have you ever said “I love to eat eggplant but don’t know how to cook it.”? I certainly have. The old standard roasted (or barbecued) 1/2 inch slices which have been soaked in salt and rubbed with olive oil just doesn’t cut it for me anymore. I need more recipes for this truly beautiful looking and fabulous tasting vegetable. We’re growing hundreds of eggplants which are getting larger by the day and I really want us all to enjoy them. We have two varieties: round striped and deep purple (not sure what size yet nor the proper names but they are lovely). Back to googling recipes again I found a few. The one I’ll try first is Indian Spiced Roasted Eggplant, which calls for turmeric and red chili/cayenne pepper. That sounds pretty healthy. I’ll let you know how it turns out. I see Martha Stewart has a slew of recipes for eggplant varieties. Do you have a favourite Eggplant recipe? If you do, please share. I just remembered I have these two cookbooks called "Plenty" and "Plenty More" that are both loaded with delicious looking recipes for Eggplant. I am excited to try as many as I can. 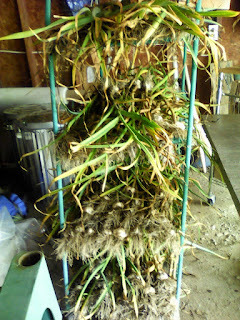 I pulled out all of the garlic the other day and gently placed it on shelves in the garage to cure for the next two weeks. There were no small or damaged bulbs. 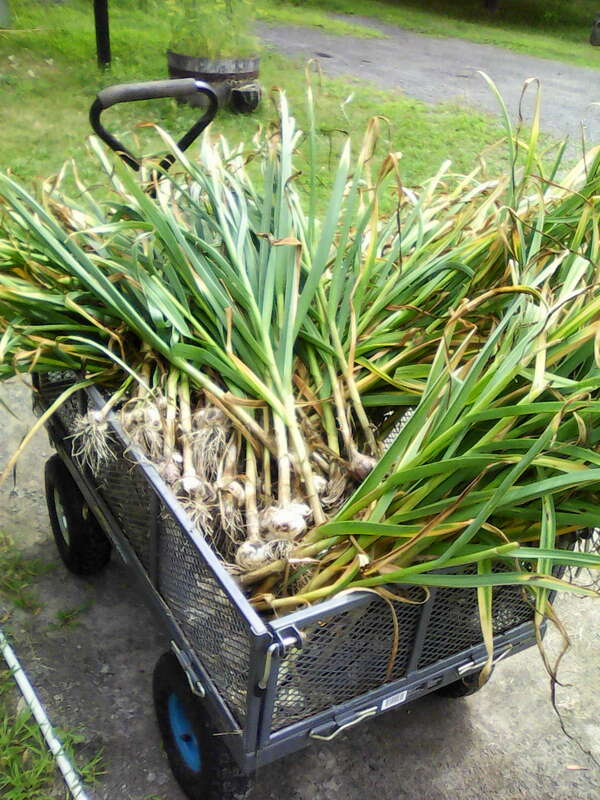 All in all it’s a good year for garlic. When I went out in the rain to take some pictures for you I didn’t think to take a basket so came back with a tee-shirt-apron holding about a pound of beans. I guess they love the rain too. These are the bush beans. The pole beans aren’t quite ready yet. 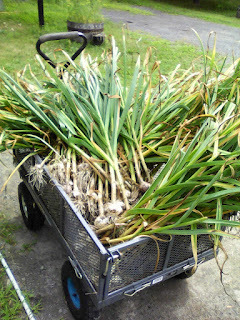 Lack of rain didn’t help the onions grow large but we do have many. I’ll start by picking the largest ones and hope the others will follow suit. In order to have cilantro for the fresh salsa when the time comes, we sowed a fresh batch in the greenhouse and will do the same outdoors this week. We also started more sunflowers for fall decor as well as beets, green onions, parsnips and carrots, dill and chard.